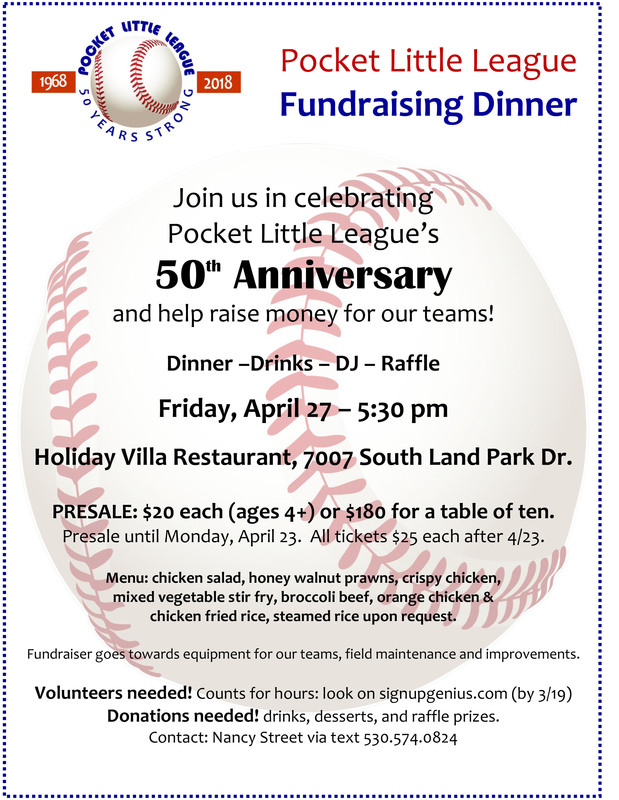 Join the entire Pocket Little League community in celebrating PLL’s 50th Anniversary and help raise money to support our teams! This will be a fun night for everyone to get together and have a great time away from the baseball fields. And the best part? 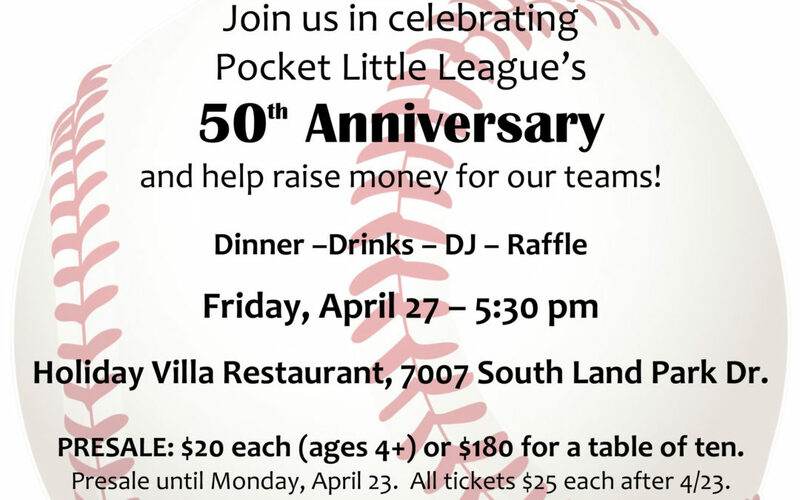 All proceeds go towards baseball equipment, field maintenance, and improvements for Pocket Little League! Who: All PLL families and friends are invited! What: Dinner, Drinks, DJ, Raffle, Desserts, and more! When: Friday, April 27th, 5:30 p.m. to 10:00 p.m.
Where: Holiday Villa Restaurant at 7007 South Land Park Dr.
Presale tickets (until 4/23) are $20 per person (ages 4+) or $180 for a table of ten. After 4/23, all tickets are $25 per person. Pre-sale drink tickets, dessert tickets, and raffle tickets are also for sale. 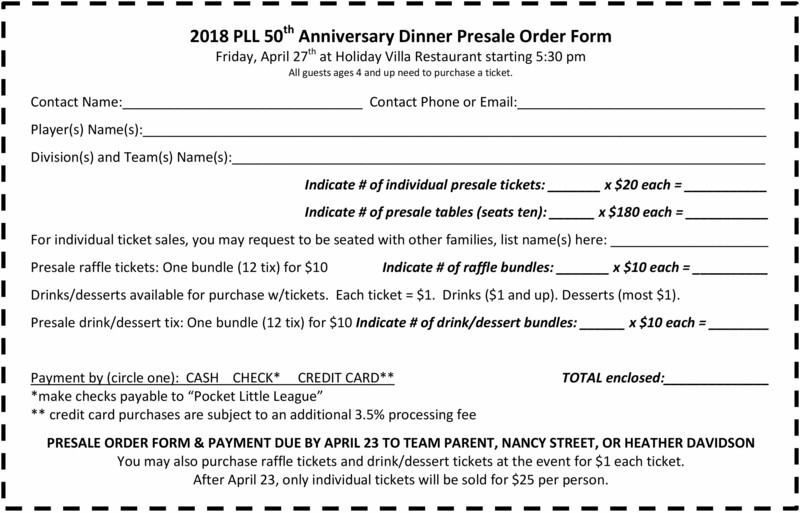 Download the Presale order form here and turn in to your Team Parent. If paying by credit card, download this additional form and turn in to your Team Parent. Volunteers Needed to work this event! Have some fun and get your volunteer hours at the same time! Donations Needed! Drinks, desserts, and raffle prizes! You can even get an hour of volunteer time for donating desserts! To sign up for a volunteer shift at the fundraiser dinner, or to donate drinks, desserts, or raffle prizes, go the the sign up genius website and reserve a spot before they fill up! For questions or additional info, please contact Nancy Street via text at 530-574-0824.